This is the second of three blog posts on the Montessori approach to writing and reading. Look for the third post in the coming weeks! 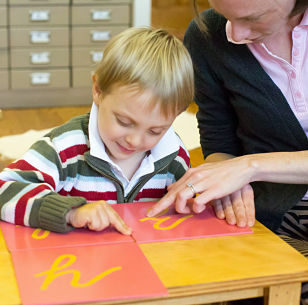 Montessori made a surprising observation that young children can actually construct words with the tools they have been given ­– communicating their thoughts by using letter symbols – well before they can decode the thoughts of others, or “read.” This makes sense, when you think of how much easier it is to locate and recognize letter symbols representing an idea in your own head, rather than starting out completely cold, trying to figure out what another person is thinking as well as what the letter symbols are. By using the symbols the children have learned to associate with matching phonetic sounds (the moveable alphabet letters), children can “make” words by arranging them together. When a child has the idea of rug in her head, she can find the first sound symbol, /r/, in the moveable alphabet box, then /u/, and then, by sounding out the word, she looks for the letter symbol /g/. She can lay these letters out and though she may not be able to actually “read” this word, she can know that she just formed the word rug. A teacher or friend may come by and read it, and the child delights in the seeming magic of written communication. The excitement of writing is born, and she wants to make more and more words with the moveable alphabet. Eventually, she begins to read what she made and may even find that her letters are in the wrong places. She may have made urg, for instance, and can correct this, analyzing and thinking through the order of the sounds as she does so. This is a deeper level of study that the moveable alphabet encourages. All of this “writing” can happen without the tremendous effort or difficulty of controlling the fingers and hands in forming the letters themselves. The difficulty has been isolated so that the child can concentrate on one aspect of making words at a time! 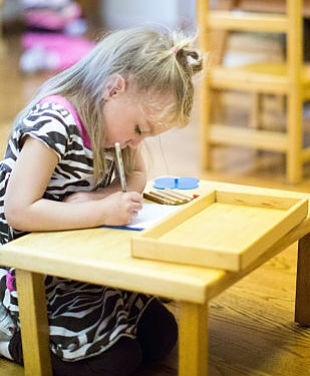 In her first school, Montessori said, “If visitors asked the children [age four], ‘Who taught you to write?’, they often answered with astonishment, ‘Taught me to write? No one has taught me!’” Not only was it incredible that the children had learned to write, but they had done so without the sensation of effort or of being taught. At first, Dr. Montessori and her colleagues wondered if it was this particular group of children, but as the experience was repeated over and over with other groups, it became clear that all children are endowed with this capacity to “absorb” and produce written expression. Because she had observed how other organisms in nature indirectly prepare themselves to develop new abilities, Dr. Montessori realized that this phenomenon was a natural one. She saw animals and organisms in nature “…gaining facility in movements … carried out almost automatically through repeated exercises even apart from the work for which they were directly intended. In this way one could set himself to a task and be already capable of carrying it out without ever having directly put his hand to it…I thought that one might be prepared to write in this way…I marveled at the simplicity…” (The Discovery of the Child, 194-195). Writing has different components and can be broken down into different skills to work on indirectly, and then we bring the movements together as a final step. By tracing the shapes of the letters, children could make them without having to master the minute mechanics of controlling the instruments for writing. But even before that, the muscular mechanism for controlling the pencil is developed simultaneously through many important Montessori materials. The sandpaper touch boards and the baric tablets teach the children to use a lightness of touch with their fingertips and tune in to the sensations there. By tracing the geometric shapes, children loosen their wrists and learn to flexibly move them, as we need to do when writing. The many tiny knobs on the puzzle maps and the solid cylinders exercise the pincer grip of the pointing finger, thumb and middle finger, the ones we use for holding a pencil. Tracing the botany cabinet leaf shapes with the thin orange stick combines the movements of the wrist with the pincer grip and also an added challenge of keeping contact between the stick’s tip and the curving edges of the leaf shapes, so that hand control and eye-hand control are exercised. Making metal insets with colored pencils help the children to guide the pencil in controlled formations with some guiding support from the insets themselves. In this way, the numerous steps of handwriting are broken down to isolate the difficulties and offer the child practice in each area. Finally, the child can put all of these together, and with their experience of making letter shapes through the sandpaper letters and making large letters on the chalkboard, they begin to try to form letters on paper with a pencil. For some children, this entire process will be smooth, but for those who run into personal challenges, you can imagine how incredibly helpful these aids and this method is to them. All the children benefit in coming to handwriting in a very natural and enjoyable way. Meanwhile, they have also learned the names of geometric shapes, botanical leaf shapes, countries of the world, the differences in cylinder dimensions and much other information that is interesting to them. They have been encouraged to move their bodies, think with their minds, and engage with others and their surroundings. As all this is going on, young children are also seeing their older classmates read all around them, and they are looking at words and hearing people read them out loud from books and other written materials. The teacher begins to write them little “messages” in slow, careful cursive letters on tiny strips of paper which the children can decode with help and begin to place around the classroom: rug, map, cup, sink, and so on. The children also practice decoding phonetically spelled words on language cards; there are numerous sets available in the room, and they progress by difficulty. In the Phonetic Object Game, the teacher writes words on strips of paper for the children to match to objects of the same name. This is all happening in conjunction with further practice with the moveable alphabet and writing. When the teacher sees signs that an individual child is ready for the next level of difficulty, she introduces the idea of phonograms as “two, three or four letters which stand together to make a new sound,” such as /th/ or /sh/. This is an exciting discovery, which opens up many more possibilities in decoding words and making words with the moveable alphabet. There are many phonograms to learn through the Phonogram Object Boxes, Phonograms Booklets, and Phonogram Cards. Children learn to recognize these phonograms all around them, even in the daily reading of what the teacher has written on the board, such as, “Today is Monday, March 7, 2017. Did you hear the birds singing this morning? There was a Robin in my yard!” The children delight in finding the phonograms in the message on the board each day. So, in these three distinct categories--words we can sound out phonetically, phonograms within words, and puzzle words--our children build their knowledge for reading. Most children can figure their way through texts around age six but continue to develop fluidity and expertise all the way through their elementary years. Reading is a terrifically challenging achievement, not to be underestimated. We adults can easily forget how hard it can be to learn to read and, consequently, become impatient for this skill to develop. But almost all children, no matter what school system they are in, will be reading by fifth grade, and no one will be there to judge when or how quickly a person learned to read as a child! That being said, because the Montessori materials and method give our children so many supports and isolate the difficulties along the way, Montessori teachers have a special advantage in spotting learning challenges and seeing where and how a child may benefit from expert assistance in acquiring this skill which can give our children so much joy and intellectual stimulation in their early formative years. Spotting an area of difficulty in the early years means that supplemental aids can alleviate and shorten the help needed for a child to fully thrive in their language and literacy development. A word of caution, however: It is important to balance recognizing where something is difficult for our children with the importance that they develop strong confidence in their abilities to overcome and correct their own challenges in their lives. As these are formative years, we want to foster personal growth and attitudes of self-sufficiency and not worrying about how one is performing in relation to others. My advice is to take a laid back attitude about your child’s reading progress unless a trained Montessori teacher suggests some specific ways you can help your child or recommends having a language specialist evaluate the way your child is processing language. Most of the time, repeated experiences, exposure, and interest are all that is needed to awaken the natural ability to read. Sharing our love and enthusiasm for reading is the very best thing you can do! Our children absorb language just by being around it, a process we can respect, have faith in, provide aids to, and actively encourage. Learning to read and write demands effort from our children, but this healthy relationship with effort and the complete satisfaction our children experience in its wake is the stuff that life is made of. These become the most meaningful and transformative experiences of our lives.